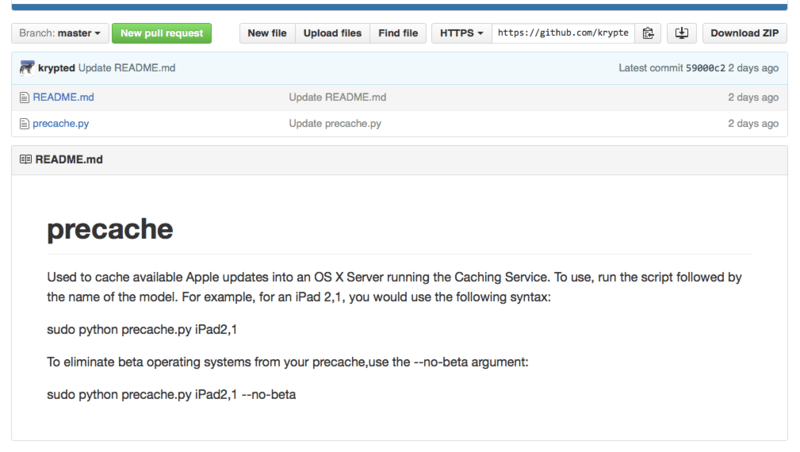 A little while back, I did a little writeup on how the OS X Caching Server caches updates at http://krypted.com/mac-security/how-the-os-x-caching-server-caches-updates/. The goal was to reverse engineer parts of how it worked for a couple of different reasons. The first was to get updates for devices to cache to my caching server prior to 15 people coming in before it’s cached and having caching it down on their own. So here’s a little script I call precache. It’s a little script that can be used to cache available Apple updates into an OS X Server that is running the Caching Service. To use, run the script followed by the name of the model. For example, for an iPad 2,1, you would use the following syntax: sudo python precache.py iPad2,1 To eliminate beta operating systems from your precache,use the –no-beta argument: sudo python precache.py iPad2,1 --no-beta I’ll probably add some other little things nee and there, this pretty much is what it is and isn’t likely to become much more. Unless someone has a good idea or forks it and adds it. Which would be cool. Enjoy. Next Next post: Episode 3 of the MacAdmins Podcast Now Available!